The current situation in Myanmar, where Muslim minority living in the country is facing a continuous violence fills hearts of each resident of the multinational Uzbekistan with pain. No one can remain indifferent to the plight of the Muslim Rohingya forced to flee to neighboring Bangladesh. In these difficult conditions, our people are eager to demonstrate such high and noble qualities as humanism, compassion, generosity and mercy. On September 18, the humanitarian cargo from Uzbekistan was delivered to the head office of the Bangladesh Red Crescent Society (BDRC) in Dhaka for onward transfer to the refugee Muslims-Rohingya people from Myanmar. According to BRDC, it has become one of the largest deliveries of humanitarian aid that the society has received from foreign countries to meet the basic needs of the Rohingya refugees in Bangladesh territory. According to official data, their number in recent days has exceeded 400 thousand people. 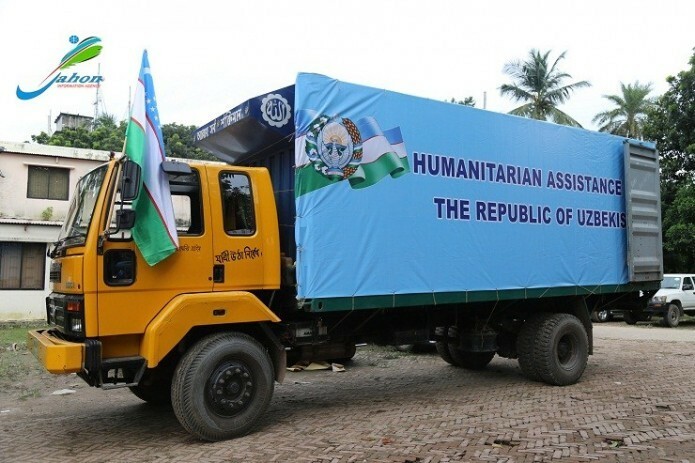 Humanitarian aid includes 14 types of vital food and items for refugees, in particular sugar, peanuts, milk powder, medicines, baby food, bottled water, hygiene products, clothing for adults and children, camping mosquito nets, blankets and other necessary products. The official ceremony of transfer of humanitarian aid was attended by the leadership of the BRDC, representatives of the Foreign Ministry and the emergencies of Bangladesh, non-governmental organizations and local media. Speaking at the event, BRDC President Hafiz Ahmed Mazumdar expressed his sincere gratitude to the Leadership of Uzbekistan for timely and generous assistance to refugees. In his words, this is not only a friendly concern on mitigation of humanitarian crisis, but also the expression of sincere humanism, "which is especially characteristic for the Uzbek people. In the separate event, it was noted that Uzbekistan`s humanitarian aid can meet the needs of at least 8 thousand families or about 50 thousand refugees.